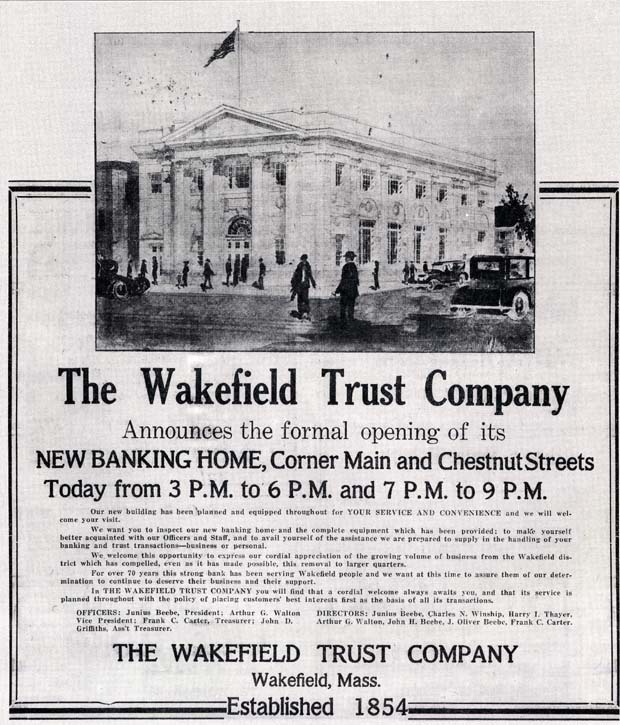 "When the Wakefield Trust Company building at the corner of Main and Chestnut Streets was dedicated in December 1924, it was heralded as having all the modern conveniences, including vaults and electric protective systems. More than 5,000 people marveled at the 'architectural beauty' of the rooms and offices as they toured the bank building during the Saturday afternoon and evening open house. Cigars were in abundance for the men while more than 1,000 rosebuds were given to the women. Organized as a State Bank in 1854, the bank became the National Bank of South Reading in 1865, and the Wakefield National Bank in 1902, the same year that the bank built a building on the opposite corner with the Wakefield Savings Bank, (now The Savings Bank). The bank became the Wakefield Trust Company in 1916." - Text from calendar by Jayne M. D'Donofrio. “Wakefield Trust Company, 1924,” NOBLE Digital Heritage, accessed April 20, 2019, https://digitalheritage.noblenet.org/noble/items/show/7166.